Uptown Hoboken is arguably where the classier parts of the neighborhood lie. From the cougars at Madison’s, to the newly erected beer hall, to the skyline views from City Bistro’s rooftop, you won’t find many frat boy bars on the north side. Ask anyone where to grab the best steak in Hoboken and the answer is invariably, again and again, Dino and Harry’s. Named one of the top 3 steakhouses in all of New Jersey, the historic spot has sat on this quiet area corner for years and years. Despite some turnover in name alone, the restaurant can still serve a medium rare cut with the best of them. I sat bar-side after work one night with a couple of my compadres. It was still early so aside from a few tables- and surprisingly a few customers dining at the bar- Dino and Harry’s had not yet had its dinner rush. With Pandora playing some mid-90′s rock we inquired about the happy hour specials and slurped down some well-vodka club sodas from the serious yet amiable bartender- the stiff drink only matched by the manliness of being inside the classic steakhouse. 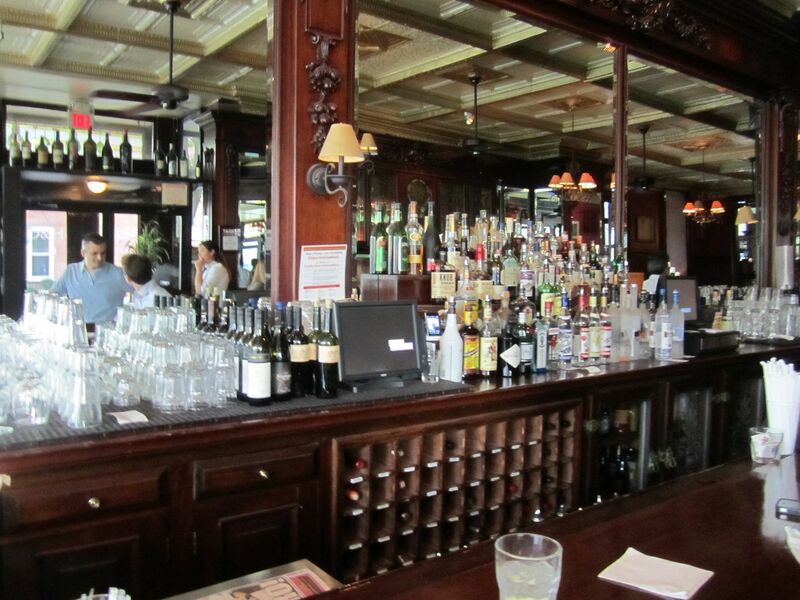 Inside, the place just has a classic Hoboken feel. It’s a difficult thing to describe, but just knowing the restaurant has been around for so many years and the little things it has- the grand piano as you walk in, an architecturally strange little nook of a room that fits something like three tables, dark wood paneling everywhere, the bright white tablecloths traditional in any steakhouse- all combine for this strange sort of opulence for the area. We only stayed for a few of the $4 drinks, but let’s be honest, you come to Dino and Harry’s for a prime cut of meat. Sitting at the bar only made us hungrier. But one thing is certain here, old school is definitely cool. Bar Type – Upscale as far as bars go, but typically you aren’t having a drink here unless you can afford dinner. Or unless you’re us. 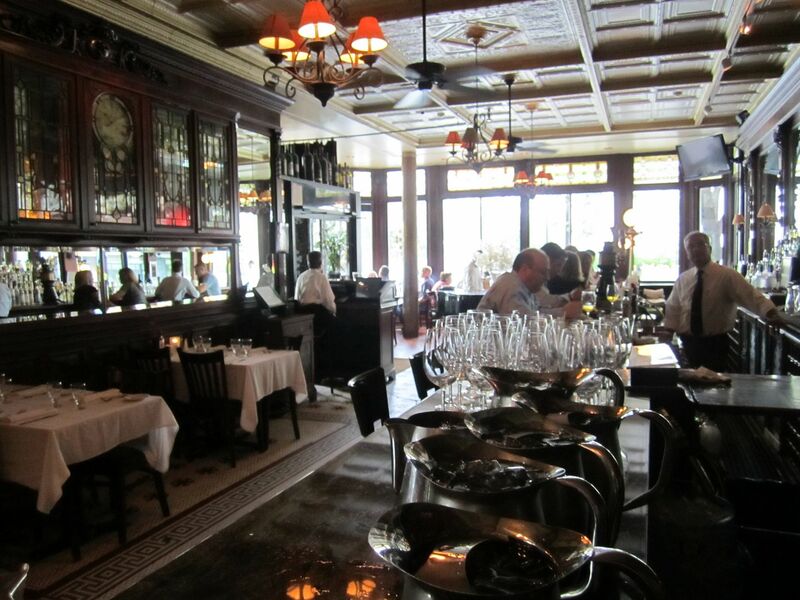 Crowd stereotype – Some big family dinners, some couples, and some afterwork types dining at the bar solo. Value – Drink specials are just okay for Happy Hour. Half price drinks, but you aren’t coming here for cheap brews. Date – Easy moneybags. Don’t go trying to impress her unless you can afford it. Or unless she’s worth it. But if a girl is bringing you here, start making wedding plans. Hookup – No. You smell like a perfectly prepared steak and sides. Can’t you meet someone somewhere else? Catch up with a friend – Absolutely. Not only that, but perfect for big groups, bachelor parties, or special nights out. First or last drink of the night – I suppose for Happy Hour if you really wanted to. Overall – One of the more refined spots in Hoboken, Dino and Harry’s is a special place. Indicative of the borough’s rich history, the place screams New Jersey. It’s a steakhouse. It’s a saloon. And it’s in a great location if you’re up for going out after. The bar alone is serviceable if you’re getting some drinks before dinner, but probably not for a destination. And that’s okay too- no knock on the food, but also not worth a trip uptown just for some drinks. I’ll give the bar a 7.9, but I’m coming back for the filet.